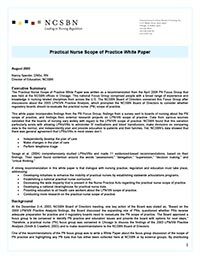 This paper was written after NCSBN brought in a focus group of LPN/VN experts from around the country. The paper reviews the rich discussion that took place at the focus group, presents internal and external research findings of the PN scope of practice, and reviews surveys that were sent to boards of nursing and external PN groups. The paper makes six recommendations. Adopted August, 2005.